This heart shaped medical alert charm is pre-engraved with Epilepsy in laser on one side and a medical symbol filled with red lead-free acrylic pain on the other. It can easily be attached to a charm bracelet via lobster clasp, which opens up to 2mm wide. Made of hypoallergenic and non-corrosive 316L surgical stainless steel. See bracelet options on next page, once you add item to cart. 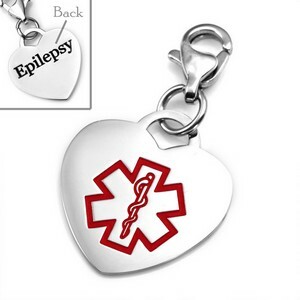 This customized medical ID tag makes a great addition to epilepsy bracelets.